I want to start off by saying that this post is politically agnostic/secular. I realize that’s not always easy, so we’ll see if I can pull it off here or if it turns into a disaster. I’m also going to show you a couple things that are almost completely backwards from what I’ve shown you so far with ontolo. There are some counterintuitive ways to use ontolo, and to interpret data from ontolo and what it might mean. There’s an ethos that rose from the hacker culture of the 80s and 90s. And when I say “hacker culture,” I don’t mean it like it’s used today. I mean it as: gaining illegal entry into computers and networks. That ethos is: Knowledge is Power. Knowledge is power, and that power is amplified by your network. Donald Trump understands this and has managed to influence the influencers to gain the attention he has acquired over the last several months. In his understanding that what gets published by the media is that which is most shocking, he’s also thrown a few bombs into the bomb factory, which he’s later had to defuse. If I ever found myself in his situation, this is how I would use ontolo. The benefit of splitting out a page into those three sections (ontolo actually splits it into several sections. Some of that will be discussed in Friday’s post, Behind the Scenes of ontolo’s Technology), is that you get a deeper insight into the intent of the publisher. If social media links in the main article can be considered “vouching” for the person, a social media link in the navigation is highly likely to be the account for publisher; be it a team of writers or a single blogger. 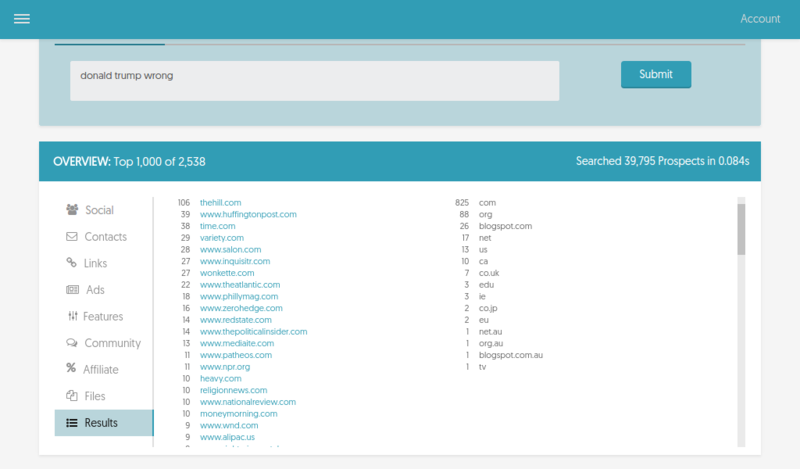 For reputation research, this is where ontolo can do what no one else can do: ontolo can find the publishers writing about a certain topic. Let’s see what that looks like. 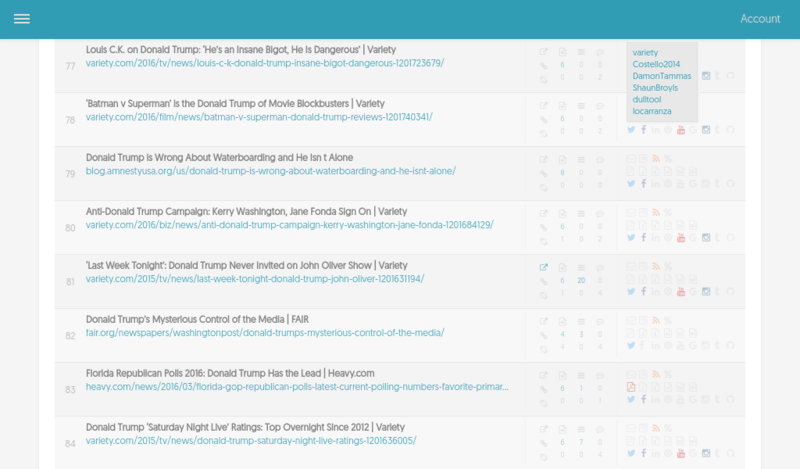 Each of the 12 screenshots below is from the Content Marketing : Blogs search form. The idea here is to find bloggers and publications that are writing about Trump and using negative language in the article. 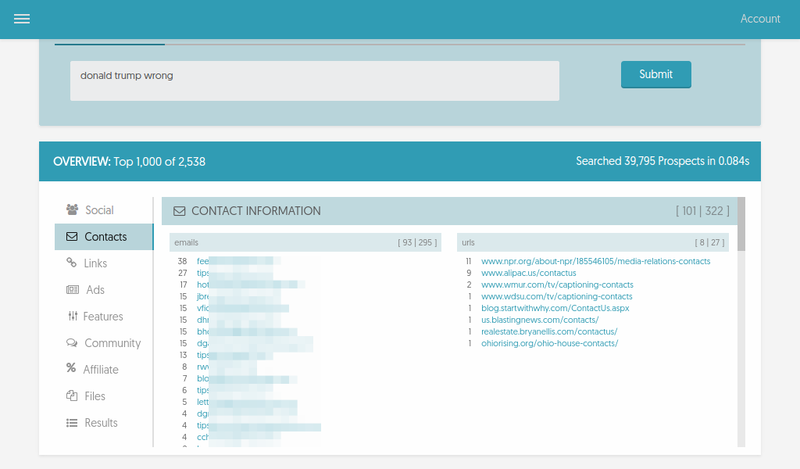 For each one, we’ll show the overview of Social accounts, Email addresses and contact forms, website counts in the Results set, then, finally, showing a small slice of the actual results, and how easy ontolo makes it to find contacts and who to reach out to. Social Media Accounts. Note how accounts appearing in the “Navigation” column often line up with the image two down for “Result Links.” This is how ontolo can help you make more insightful decisions about the meaning of links, accounts, etc. 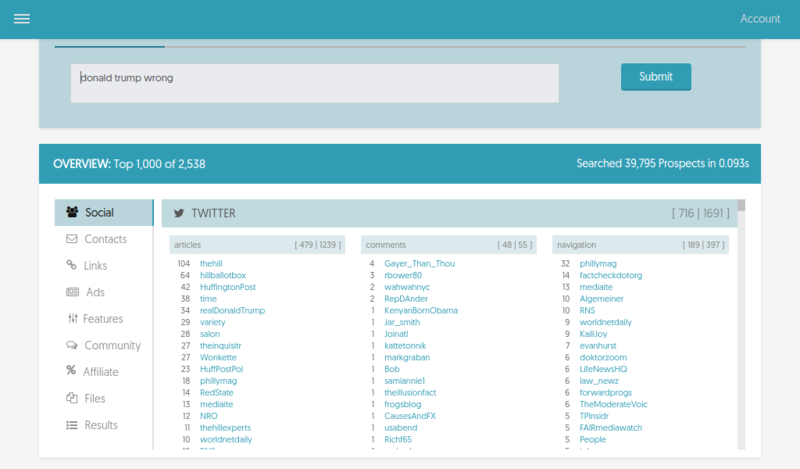 As you can see, the nature of insights from ontolo lets you discover intents and insights with a very high level of precision. If this is something you might be interested in, for this week only, we’re offering 10% off all plans, including yearly plans, which are already discounted 10%.